With the kerfuffle going on regarding a certain Katy, TX firearms business, I thought it would be good to demonstrate the proper response to totalitarian pressure, albeit the freelance type in this case. I have been to this indoor range during a visit to family in NJ back in April. What was notable was that it was probably the single cleanest range I have ever been to. And the target carriers actually worked well. I guess being in NJ, they take special care to make sure everything is well taken care of, given the tyranny they live under. I did not know the faith of the owners and it never really mattered to me. 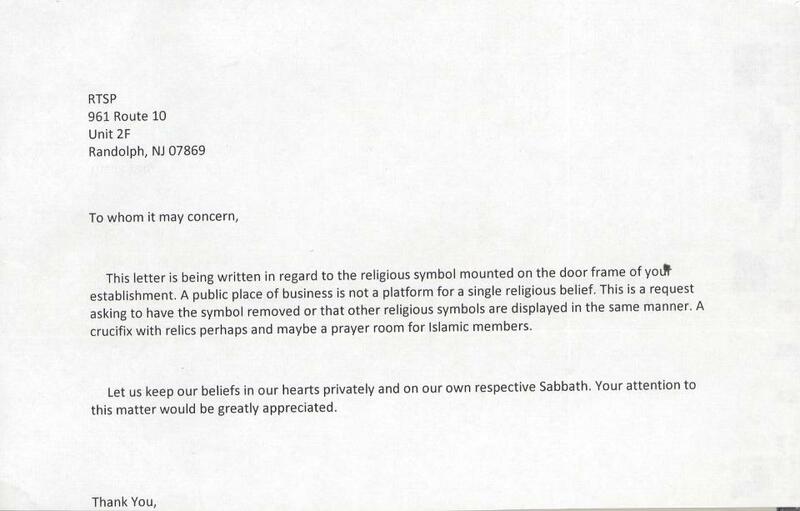 Nor did I ever notice the mezuzahs this cowardly letter references. (I actually have a mezuzah that I picked up on a trip to Israel last year as a memorial token.) This range is the private property of it’s owners. As, presumably, Jews, it is entirely appropriate that they would put mezuzahs on the entrances. The letter writer has apparently been drinking a little too much of the “You Didn’t Build That” kool-aide that Dear Reader has been serving up. The owners’ public response is basically “GFY” in different words. FYI, this letter and its envelope have been handed over to law enforcement…just for safe keeping! If you happen to be in Randolph, NJ and have the time to do something you thought was highly unlikely in that state, (i.e. : go shooting), stop by RTSP and rent one of their firearms and have a blast. Do it for fun, do it just to say “I shot a gun in NJ,” and do it to support businessmen who built it themselves and poke a stick in the eye of anonymous cowards who presume to tell others what they can and cannot have on their own doorposts. And if you are so inclined, pause for a moment when you see the mezuzah and ponder why the mezuzah is there. Shabbat Shalom and Mazel Tov.